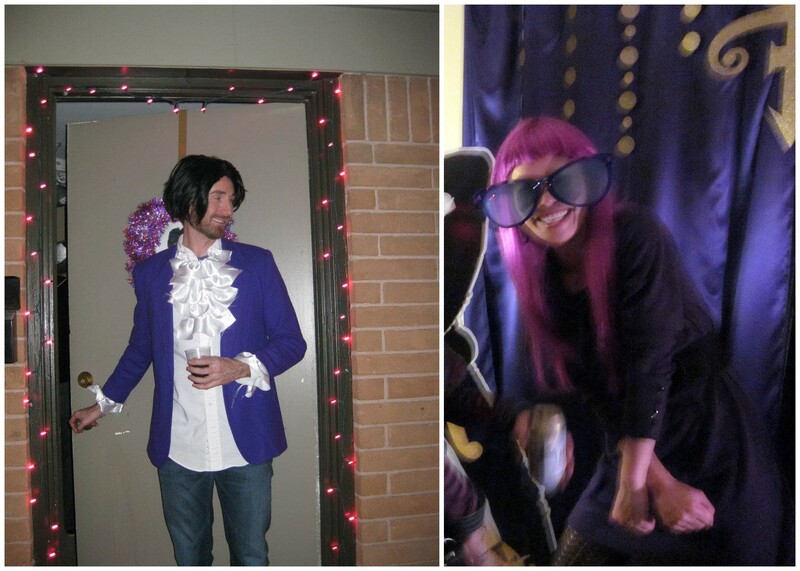 Princemas 2011 was a smashing success! We had about 70 people swing by our tiny house—there was a cozy fire for chatting and s’mores, a Prince photo booth, plenty of purple and costumes, a well stocked bar, and lots of dancing. C-Man and I had buckets of fun and it seemed like our friends enjoyed it too. 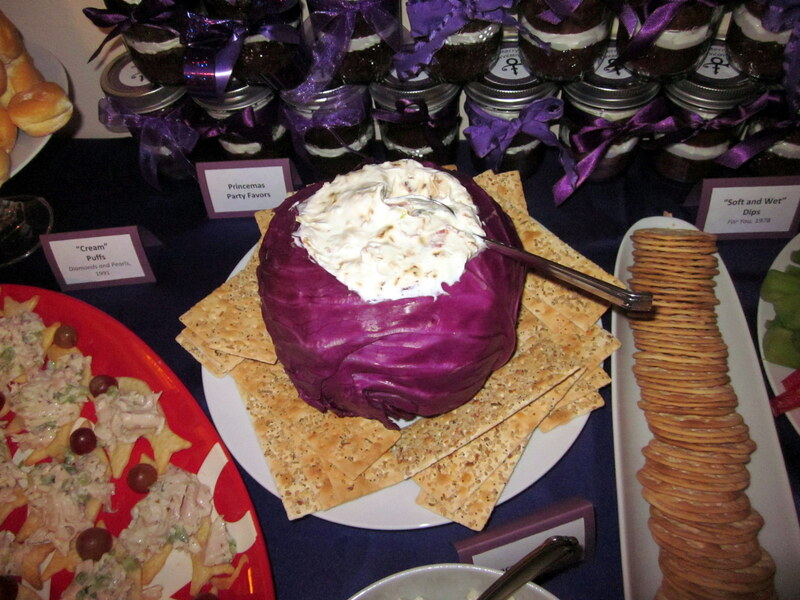 Here are some of the highlights of the party decor, costumes, and food. 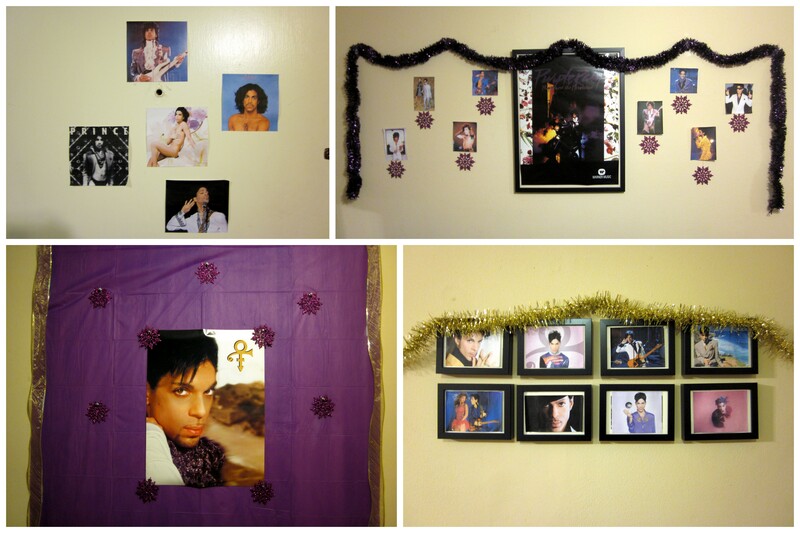 For decorations, I reused some of the purple ornaments and wreaths from previous Princemas parties, bought Prince posters from ebay, hung purple Christmas lights, printed lots of photos of Prince, and used purple tablecloths and dinnerware. The photo booth was in C-Man’s man-cave. I bought some fabric from Joann’s and pinned it up on the sliding door curtains as the backdrop. Then I used my Cricut to cut out 2 inch and 1 inch circles out of gold 12×12 scrapbook paper and hot glued them onto fishing wire. 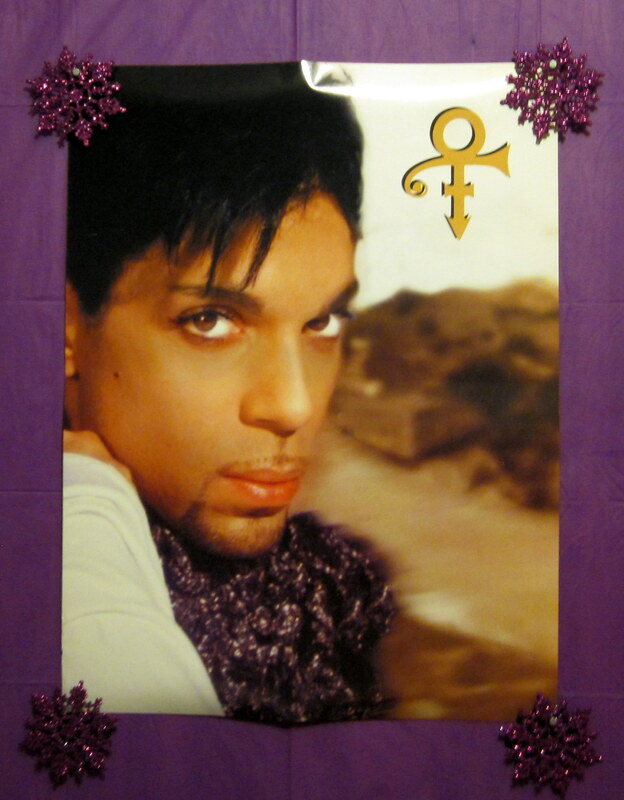 I cut out the Prince symbol from three pieces of gold 12×12 scrapbook paper. The vintage cardboard cutouts of Prince came from ebay while the props (big glasses, tiara, cowboy hat, ribbons) came from Dollar Tree. It was a bring-your-own-camera photo booth, but I captured some of these fun shots on my camera. The food was Prince-themed, although I chose the menu and then found the songs to match. All the dips were in reference to Prince’s 1978 “Soft and Wet”. 1. Bacon and Leek Dip from Martha Stewart. I served it in a scooped out red cabbage per MS as well. 2. Baked Raspberry Brie-ay – super easy and always a crowd-pleaser! Preheat oven to 350°F. Slice a brie in half to make two circles. Scoop out some of the brie to make a cavity. Fill the cavity with 2-3 tablespoons of jam. Place the two brie halves back together and wrap with Pillsbury crescent dinner roll dough. Press perforations and seal entire brie with the dough. Pierce the top of the dough twice with a fork. Beat one egg and one tablespoon of water. Brush the egg/water mixture over the dough. Place the wrapped brie into a greased brie baker or small pan. Bake for 20 minutes or until golden brown. 3. Raspberry and Blackberry Chocolate Cups (“Chocolate Box” 2009) – Using a chocolate mold, brush melted chocolate into cup molds. Freeze for 15 minutes (or up to two weeks in sealed containers). Remove from freezer and tap out the chocolate cups. Using an electric mixer, whisk two cups heavy cream and 6 oz. creme fraiche in a very cold bowl until stiff peaks form. Place cream mixture in a piping bag or ziploc bag fitted with a round tip. 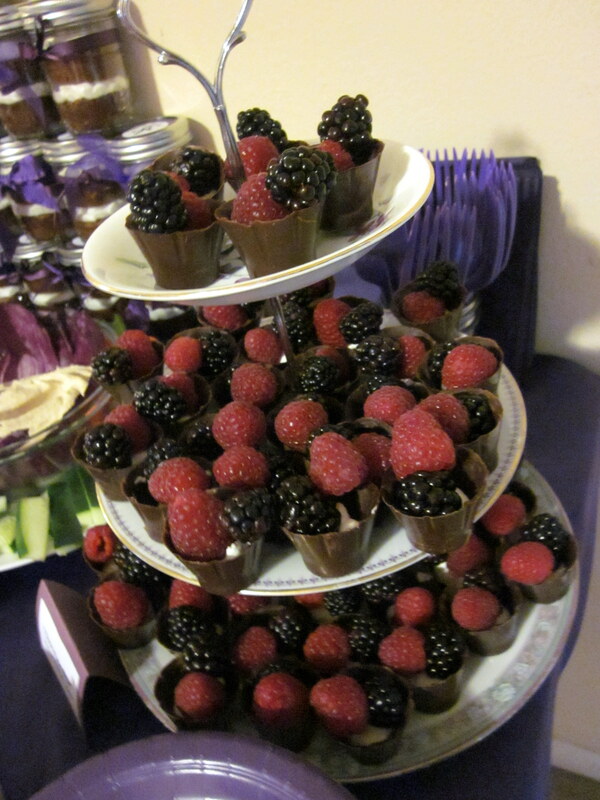 Pipe cream into chocolate cups and top with berries. 4. 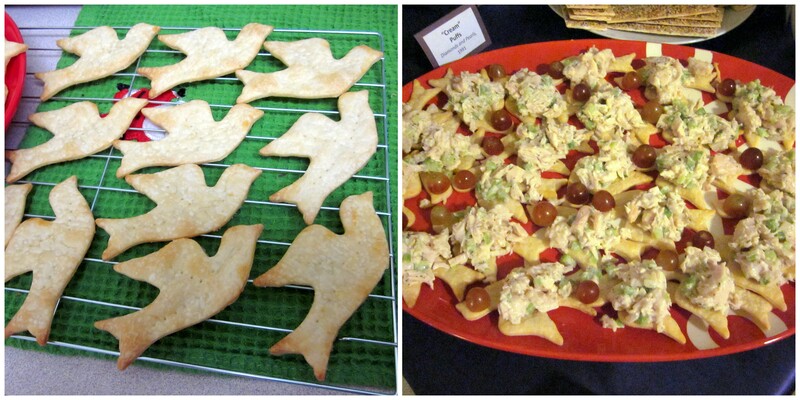 Dove Crackers for “When Doves Cry” Canapes. Preheat oven to 400°F. Bring refrigerated Pillsbury pie crust to room temperature according to box directions. Roll out dough onto floured surface. Using a dove cookie cutter, cut out dove shapes and place on baking sheet covered with parchment paper. Pierce each dove twice with a fork. Beat together one egg and one tablespoon water. Brush the egg/water mixture onto the doves and lightly sprinkle with kosher salt. Bake for 9-10 minutes or until golden brown. Allow to cool before placing chicken salad on top of the crackers. Costco Cream Puffs (“Cream” 1991) placed on a plastic-wrapped foam tree and attached using toothpicks. We had a ton of mixers for the vodka, gin, bourbon, sake, tequila, and rum which also doubled as the non-alcoholic drinks. C-Man mixed our version of “Purple Rain” with vodka, cranberry juice, blue curacao, and sweet and sour mix. It was more of a bluish purple but got the job done. Plus our wonderful guests brought plenty of beer and wine. For cupcakes in a jar, you can either make one big cupcake and cut it in half or you can use two smaller cupcakes for each jar. I went with the latter. Chocolate cupcakes – I used the same recipe for C-Man’s Mom’s Chocolate Bundt Cake recipe and just poured the batter into greased cupcake pans with no cupcake liners. With each cup filled halfway with batter, this made 32 cupcakes . These came out bigger than I wanted so I recommend filling each cup about a quarter to a third full. This was my first time baking cupcakes EVER so of course, I burned them a little at 350°F for 20 minutes, 15 minutes probably would have worked better. Allow cupcakes to cool and then stuff one into a jar. Using a piping bag fitted with a tip (mine was a #21), pipe frosting onto the cupcake (I used store-bought vanilla cream frosting). Add another cupcake and another layer of frosting. I topped each one off with a sprinkling of disco dust in purple. Pumpkin ginger cupcakes – I used this recipe from allrecipes.com except I went with one of the reviewer’s tips to use 1 and 1/4 tsp ground ginger total instead of 1/2 tsp ginger and 1/3 cup crystallized ginger. I filled each cup about a quarter to a third full so the batter made 42 cupcakes. Even at 15 minutes, some of the cupcakes came out a bit burnt. (I made C-Man eat all my bad cupcakes, but he didn’t seem to complain. :)) I ran out of vanilla frosting after the first layer so the top layer was cream cheese frosting. These cupcakes took much longer than the chocolate ones but were quite tasty. 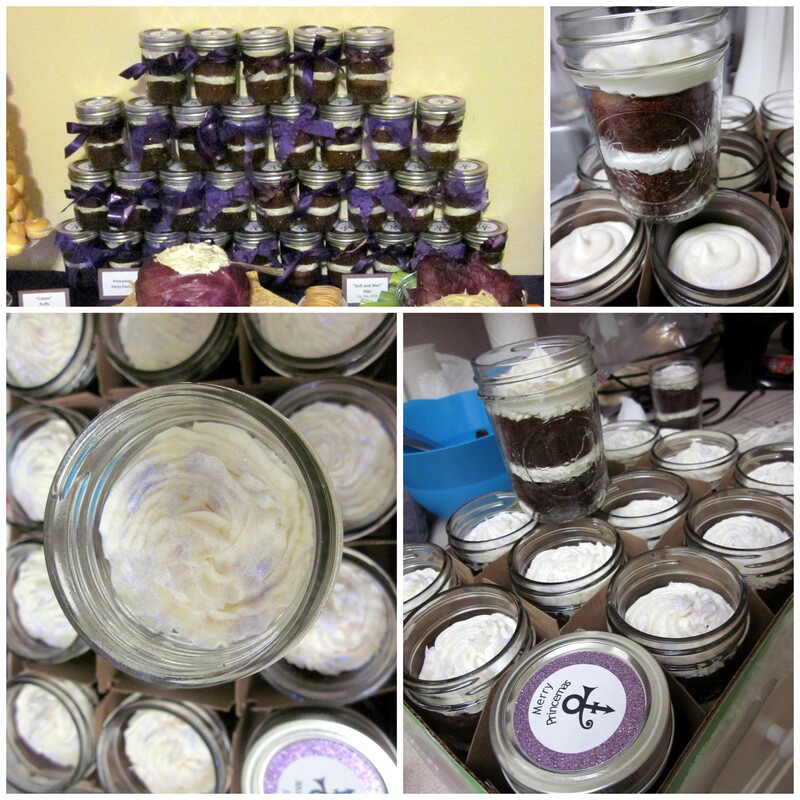 I tied a purple ribbon around each jar and added a “Merry Princemas” label to the top. I love how my Cricut makes it 10x easier to create labels! 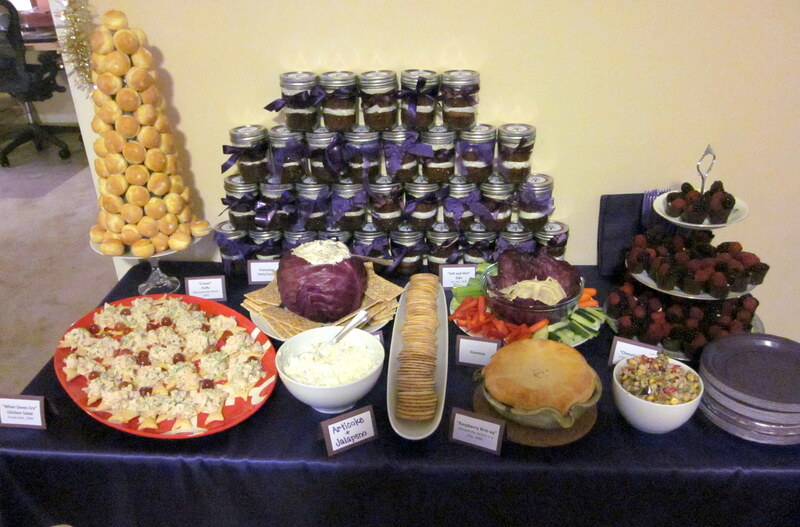 The 32 stacked cupcake jars made a pretty addition to the food table. I began party preparations back in October, but it still didn’t seem like enough time to finish everything. Always start planning as early as possible. Although clear plastic cups show pretty drinks and colors, they break easily. I’m still finding shards of plastic on my lawn. When serving lots of purple drinks and food, be prepared to get lots of pink and purple stains out of the carpet the next day. People will always find something to complain about (a couple girls drove off yelling they’ll blast Prince music since apparently we didn’t play enough for them) so learn to live with it, especially when they’re not your friends. Always take an excessive amount of pictures because the next day, you’ll realize you didn’t take enough. But all in all, it was probably the best party we’ve had to date. I’m so thankful for everyone who came out and the fun we had. Merry Princemas to all and to all a good night!! 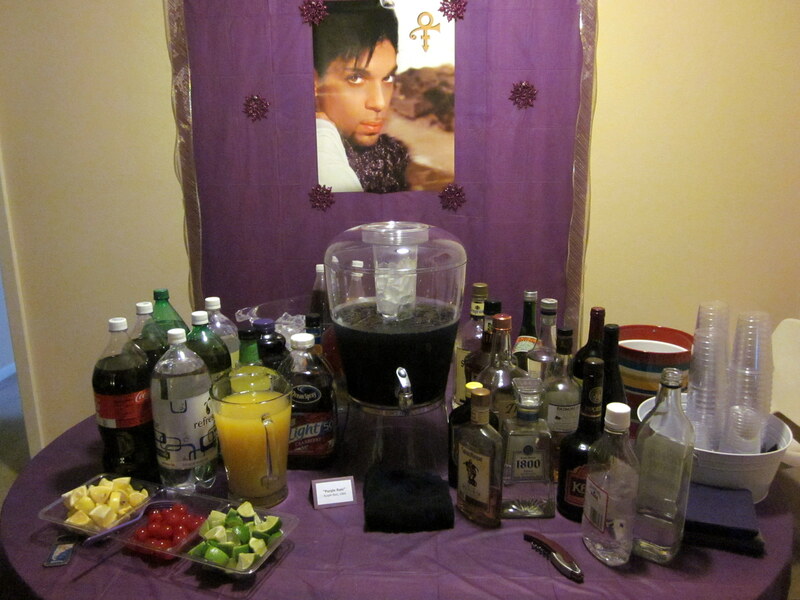 This entry was posted in Decorations, Food and tagged Cupcakes in a Jar, Prince, Princemas, purple decor. Bookmark the permalink. wonderful party!!! You have so many details for house parties, they’re envy worthy! I love your cupcake in a jar. I would’ve stolen a couple of them. I also like your note about how people will find something to complain about. Haters gonna hate. What biotches! Thanks Nellie! I wish you were closer and could join. And I know, darn haters! wish i was there!!! we should do a concurrent LA princemas party. one day! Totally! I wish we were in the same town more often! You have put a lot of work and effort into this party and it shows. 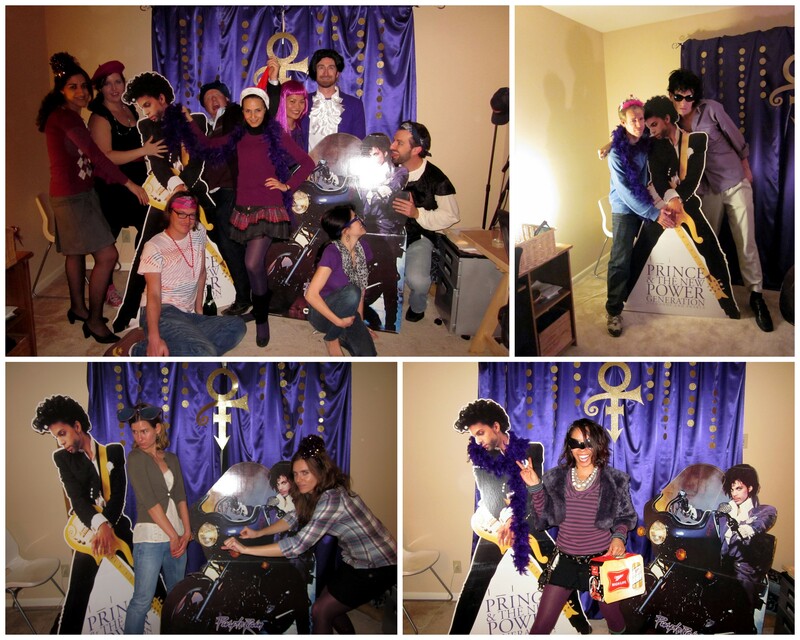 I am a big Prince fan and I would love to attend a Prince party like this or have my own but I don’t have any Prince fan friends. Thank you for sharing your photos and experience with us so that we can appreciate your work.